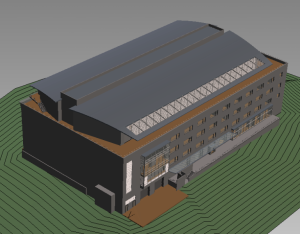 We now offer 3D models using Revit or Bentley. During our survey, we record the slab-to-slab elevations, as well as window/sill heights, door heights, plus exterior details. We combine this information with interior and perimeter digital photos to create the model. With nearly universal adoption of BIM, 3D Modeling is finding a higher profile. Architects and designers alike are realizing the cost and efficiency benefits of working in 3D versus 2D. We can help you by creating a base model to fulfill your project requirements. Depending on your base model project requirements, we can create basic or detailed 3D Models. Detailed 3D Modeling requires 3D Laser Scanning of the building and can capture any visible feature. If we’ve prepared as-built drawings, then the preparation of a Revit or Bentley 3D model is straightforward. During our interior survey we simply record the slab-to-slab elevations, as well as window/sill heights, door heights, plus exterior details as required (eg stairs and walkways, roof/gutter lines, etc). We first create the 2D drawings in AutoCAD, then our skilled Revit CAD operators, using extensive photo documentation collected by our field surveyors, will build the Revit/Bentley model, based on our laser-accurate measurements. Amount of detail collected of course can be varied, depending on budgets and requirements. With all our projects, we take digital photos around the perimeter, as well as a few interior shots. However, when preparing 3D models, in Revit or Bentley, we take many more interior and exterior photos. We can also integrate 3D laser scanning with our 2D laser surveys, for the ultimate in cost-effective laser-measured 3D models!